Oil and Gas | Industries | ChemTreat, Inc.
We strive to create value for our oil and gas customers by reducing water and energy consumption, eliminating downtime, extending equipment life, and protecting the environment. In the oil and gas industry, obtaining the correct chemistry for your application can result in increased production, increased run time, and a longer lifecycle for your assets. Correct chemistry is just one part of the equation for a quality partnership between a chemical supplier and producer or asset owner; deep expertise and quality local service are also needed to ensure the correct chemistry is working to meet your needs. ChemTreat is a leading supplier of specialty chemicals in North and South America. Our field representatives typically have over 16 years of experience in the basin they support, solving the unique problems that arise every day for our oil and gas customers. ChemTreat’s goal is to provide you with the best service through our extensive product knowledge and local expertise. As one of the world’s largest specialty chemical providers, ChemTreat’s customized solutions address the challenges faced by water disposal asset owners. Our customized product lines cover the entire spectrum of challenges for disposal well operators, including increasing oil skim, H2S scavengers, biocides, scale and corrosion inhibitors, and other specialty chemicals. ChemTreat understands the variability of produced and flowback waters that enter your facilities. We offer the lowest-cost applications to help protect your assets, lower your operational costs, increase your profits through increased oil skim, and lower injection rate pressures while allowing for a higher throughput of water at regulated pressures. The disposal well industry is a key component to the oil and gas sector, and serves a critical need to manage and process the industry’s wastewater. The volumes of produced and flowback waters that require deep well disposal is under scrutiny, but remains a critical need in every basin. As regulation and competition increases, disposal well owners and operators require expertise to solve their unique challenges, reduce costs, and increase profit while protecting their assets. ChemTreat experts can help evaluate the levels of valuable hydrocarbons entrapped in the waters going downhole and allow customer to increase their slop oil sales through the correct chemistry application for customers with valuable oil skim in their waters. Many operators will acidize their wells frequently and limit their downhole injection rates based on pressure. ChemTreat’s custom formulations help operators minimize or eliminate well acid cleanings, protecting their assets while increasing the volumes of water injected at regulated pressures. This results in more revenue for the disposal well owner and increased service for their customers by minimizing wait times and ensuring deliveries are not turned away. The additional decrease in electrical costs on pumping systems and filter maintenance programs helps improve our customers’ bottom lines. ChemTreat delivers $2.08M in annual cost benefit to a Canadian treatment, recovery, and disposal facility. ChemTreat’s simple strategy in the midstream oil & gas market is to provide superior service quickly, use the latest technology for long-term impact, and employ the best and most experienced local talent. With the steady increase in natural gas supply and changing gas compositions, midstream players and E&P companies that own midstream assets are looking at ways to maximize their throughput without compromising profit in the face of gas price fluctuations. Many challenges also arise in the conditioning and processing of natural gas from the well head, through the gathering lines, and ultimately, to the treatment plant. As one of the world’s largest providers of industrial chemical solutions and services, ChemTreat is strategically positioned to meet these industry challenges. We have developed industry-focused solutions to improve the reliability of operations, protect employees and the environment, and make our customers more competitive. In many cases, midstream producers have limited time and/or expertise to properly mitigate risks. Therefore, choosing a vendor partner to manage and optimize a system’s chemical needs is a decision producers cannot afford to get wrong. ChemTreat has built lasting relationships with a wide range of valued oil and gas customers over the years. We have a better understanding of the unique problems our customers face on a daily basis, and we leverage this knowledge to create tailored treatment programs proven to protect your assets, keep operating costs manageable, and maximize critical process efficiency. It is this level of targeted expertise that allows us to prevent and troubleshoot problems before they can adversely impact our customers’ ability to accomplish their core mission. 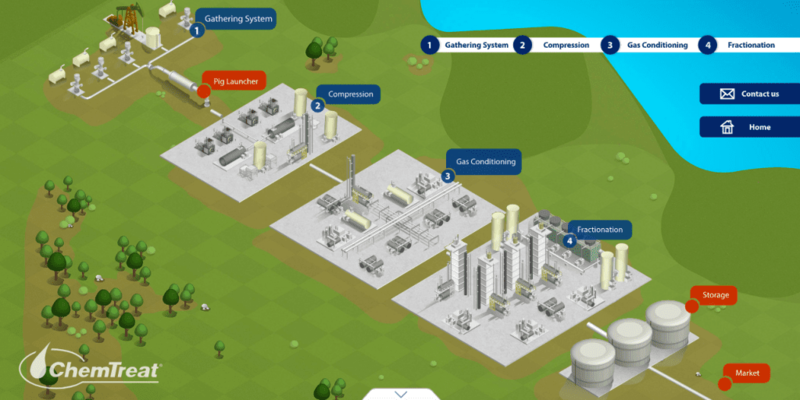 From the well head through the gathering lines to the treatment plant, ChemTreat offers solutions for the conditioning and processing of natural gas. A large natural gas company was having corrosion and microbiological issues within their gathering system’s numerous locations. ChemTreat continues to exceed customer expectations in the oil sands industry because we have a simple strategy: provide superior service with a long-term view, use the most current technology, and employ the best people. Oil sands producers are constantly striving to optimize production while maintaining the highest levels of quality and compliance. ChemTreat’s process and water management strategies improve the efficiency of plant operations, protect employees and the environment, and ultimately make our customers more competitive. Enabling oil sands producers to constantly optimize production while maintaining the highest levels of quality and compliance. Connect with our oil and gas experts to learn more about ChemTreat’s capabilities. At ChemTreat, we know combining the right people and the right chemistry results in the best possible solution for our customers. We help our production chemical clients identify flow impairment and asset damage root causes, then recommend the most efficient treatment programs for their specific problem. ChemTreat has built an industry-leading reputation by providing unique solutions and quality custom chemistry to help our customers increase production. Our typical field team member has an average of 16 years of experience living and working in the basins they support. The team is supported by industry-leading products, formulations, and application experts who work alongside our customers to reduce their lifting costs and protect their assets. ChemTreat has built its reputation by providing industry-leading products, formulations, and application experts who work alongside our customers to reduce their lifting costs and protect their assets. At ChemTreat, we know bringing together the right people and the right chemistry results in the best possible solution for our customers. We can help you identify flow impairment and asset damage root causes, then recommend the most effective treatment programs for your specific problem. We have built an industry-leading reputation by providing unique solutions and quality custom chemistry to help our customers increase production. Our field team members have an average of 16 years of experience living and working in the basins they support. The team is supported by industry-leading products, formulations, and application experts who work alongside our customers to help them reduce lifting costs and protect their assets. Refining crude oil reliably and efficiently, with minimal environmental impact, is the hallmark of the modern refinery. Expansions and upgrades mean critical water systems are often stretched beyond their original design. ChemTreat’s experienced field engineers understand the complexities of refinery operations. We know using our leading-edge feed and control equipment to apply our unique product technologies ensures reliable refinery operation, and our best-in-class technical excellence in wastewater treatment drives environmental compliance in this critical operation. As one of the world’s largest providers of water treatment products and services, ChemTreat is strategically positioned to meet the current and future needs of the hydrocarbon processing industry. ChemTreat is staffed to provide coverage to most major refining customers. Technical excellence in influent and refinery wastewater treatment programs ensures compliance and demonstrates our commitment to the environment. Our R&D group creates new technologies for refinery process applications, hydraulic fracturing, and oil sands operations. ChemTreat’s non-invasive, on-line cleaning program returns a gas processing plant’s system back to design cooling efficiency and operation. Our sales engineers are ready to help you find the right solution. Fill out the form to connect with your local ChemTreat representative. by phone or e-mail Monday through Friday, 8 am to 7 pm EST.